The Savin 2518 multifunction monochrome laser printer provides printing, faxing, copying and color scanning capabilities in one convenient and easy to use package. Plenty of customization options provide variety that can accommodate any custom small business need, combining the features of several business machines into one unit. Fast fax communications, network printer monitoring and management utilities, progressive digital technology, and automatic duplexing round out the package on this versatile digital imaging system. The Savin 2518 offers print speeds of up to 18 pages per minute for monochrome document reproduction. 16 MB of standard printer memory can be upgraded to 144 MB to accommodate effortless printing of business documents with plenty of free memory remaining to handle sharing this unit as a network resource. 16 MB of copier memory is expandable to 48 MB for better handling of document duplexing and special copy functions. It takes less than 20 seconds for the Savin 2518 to warm up from a powered down state and first copy times average 7 seconds to provide quick processing for people who need to copy on the fly, whether it be a single page or multiple page document. Other copier features include auto reduce/enlarge, image rotation, photo and text modes, series copy, electronic sort, auto tray switch and duplexing. 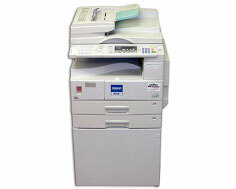 50 programmable user codes allow the copier to be used in public places in a way that eliminates unauthorized access. 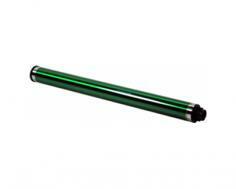 The platen can scan a maximum document size of 11 x 17 in. and produce document sizes ranging from 5.5 x 8.5 in. to 11 x 17 in. The standard paper supply offers an input capacity of 600 sheets, divided between two 250 sheet drawers and a 100 sheet multipurpose tray. Expansion banks can be purchased to increase input capacity to a maximum of 1,600 sheets of plain paper. A 250 sheet internal paper output tray provides plenty of room for larger printed output within the confines of the unit's housing, without any trays protruding out of the side. This allows for maximum functionality while utilizing minimal space. The fax module comes with a 33.6 Kbps fax modem that can transmit documents at 3 seconds per page, reducing long distance bills, and can scan a page in approximately 1.2 seconds at standard fax resolutions. 4 MB of page memory can store up to 160 pages at letter size and document sizes up to 11 x 17 in. can be transmitted and received. Other fax features include auto reduction, send later, restricted access, telephone directory, dual access, batch transmission, forwarding and one hour memory backup. Additional upgrades for the Savin 2518 include a 50 sheet auto reversing document feeder, a 30 sheet non-reversing document feeder, PostScript 2 emulation, a flat platen cover and a telephone handset. Additional features include collation, edge smoothing, watermarks, envelope printing and tray locking. The Savin 2518 can handle paper weights up to 93 pounds, accommodating many types of special media. The maximum print speed of the Savin 2518 is significantly lower than that of other comparable models in its class. The standard 16 MB of printer RAM is not enough to handle multitasking if the optional Ethernet interface is installed, making it absolutely necessary to upgrade to the maximum allowable capacity. A parallel interface is the only way to directly connect to a computer, as UBS is not included. This can make connection to newer PC's difficult. Operating system compatibility is limited, not supporting Linux systems, Mac OS X, Windows Vista or Windows 7. Windows 2003 Server is also not supported, making integration into modern networks potentially difficult. A maximum print resolution of 600 dots per inch is half that of comparable models, resulting in reduced print quality. 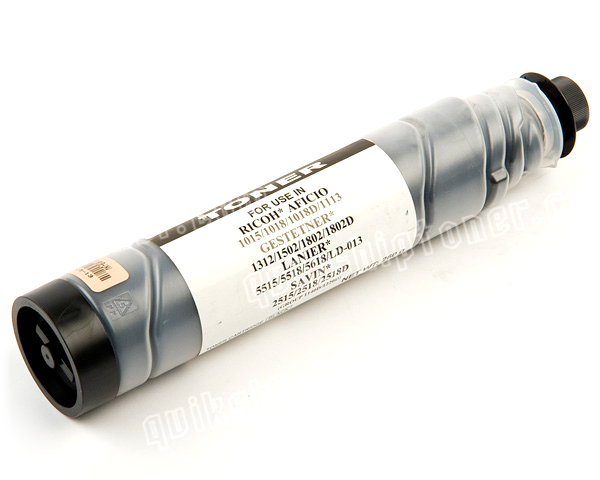 Review it: "Savin 2518 "
Toner cartridges and drums can be purchased separately, reducing consumable costs by allowing drums to be used to their full capacity before having to be replaced. Replacement toner with a standard yield capacity of 9,000 pages can be purchased very inexpensively and at average prices can reduce toner costs to one cent for 5 printed pages.